The track and field team continues to improves during the outdoor part of the season. The Aztecs seem to be better as the season continuous. The track & field team competed at the ACCAC Conference Meet at Mesa Community College on March 29th. As the Aztecs took home four individual conference titles and also tacked on two more national qualifying marks on the day. “I kind of wasn’t mentally into indoor so just working on my miles and keeping up with me training regimen helps with the outdoors training” “Especially with distance running the more miles the better,” Bruno said. Mary Simi and earned a spot at national with a qualifying time and set personal record in the 1,500 meter race with a time of 4:59.27. Sophomore Kaylen Fox took second place with a personal best time of 2:22.02. In the 800. 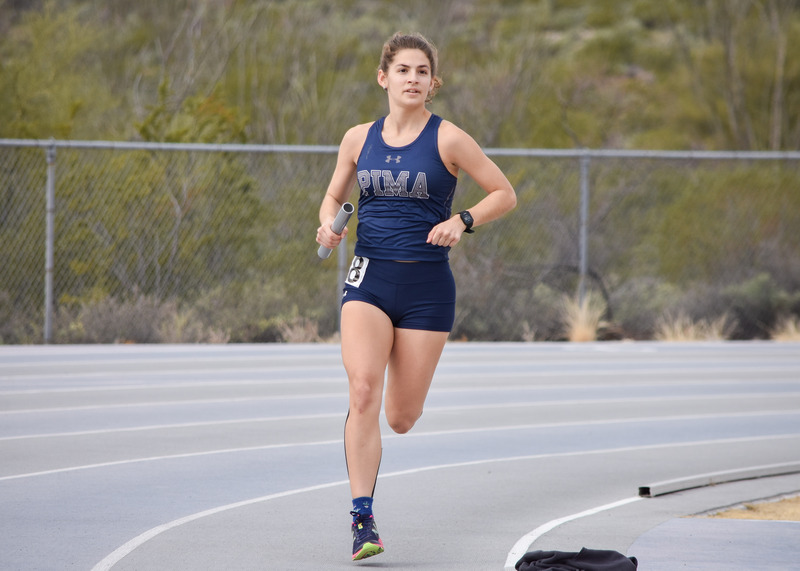 The Pima Community College Aztecs had a good day at the Cody McBride Invitational in Phoenix on March 21 and 23. Bruno got off to a good start at the invitationa taking first place in the 800 meter run and persol best of 2 minutes 57 seconds. She kemp on running taking first place again this time in the 1,500 meter race with a time of 4 minutes 53 seconds both national qualifying times. On the men’s side of the Christian Edgerson took first place in the long jump with a jump of 22 feet seven inches and Tyler Valenzuela came in second place in the pole vault with a qualifying distance 14 feet 7 inches. Bruno took first place and set a new personal-record in the 800 meter race as she finished with a national qualifying time of 2 minutes, 21.57 seconds. She wasn’t finished as she took first place in the 1,500 meter race with a time of 4:53.68. Her time gave her another national qualifier and put her No. 3 in the nation. The Aztec men’s and women’s track & field teams opened the outdoor season on March 15 and 16th at the Willie Williams Invitational at the Roy P. Drachman Stadium in Tucson. Freshman Jalen Coleman looked comfortable outdoors, taking first place in the triple jump with a personal best mark of 48 feet 11 inches. Fellow freshmen Royal Miller IV also hit a personal best in the triple jump with a mark of 44 feet. Robert Williamson and Christian Edgerson both placed seventh in their respective events Williamson in the 400 meter hurdle and edgeerson in the long jump. Hailey Myles took seventh place to qualify for national with a distinct of 38 feet 6 inches in the triple jump and the 4X100 relay team made up of Kymori Henderson, Raely Fair, Berkeley Larsen, and Annabella Spencer crossed the finish line With a time of 49.22 to take fourth place.